A weekly podcast that breaks down important policy issues from a conservative perspective. Several leading voices on the left have joined together to call for the abolishment of the Electoral College, and replace it with a national popular vote. This week, Dr. John York debunks their arguments, and explains why the Electoral College is still the best system for electing our Presidents. Liberals in Congress are pushing The Equality Act, but this isn’t the first time. If passed, the bill would allow the LGBT community to be considered a “protected class” under federal law. So what’s the problem with that? This week, we sit down with Emilie Kao to discuss why the latest version of The Equality Act is no act of equality. “Some examples are in order. Have asthma? You’re probably ineligible to join the military. A depressive disorder? Sorry, no. Torn rotator cuff in your shoulder? Nope. Come back perhaps when it heals or is repaired.” This week, Lieutenant General Thomas Spoehr, director of Heritage’s Center for National Defense, explains what’s actually in the Pentagon’s new policy and why gender dysphoria must remain a bar to military service. When the news broke that famous actors and several other wealthy individuals had been charged with conspiracy to illicitly gain admission for their children to attend prestigious universities, late night TV had a ball poking fun, and many people took to social media to voice their outrage. While this story is great for news headlines, the real story is what this says about our education system in America. This week media mogul Armstrong Williams and Heritage Foundation Policy Analyst Mary Clare Amselem weigh in. In the wake of policy proposals from Rep. Alexandria Ocasio-Cortez and Sen. Bernie Sanders, it seems that more and more Americans are unaware of not just the importance of earning a wage but the dignity and value in work. How did we get to this point and how can we fix it? 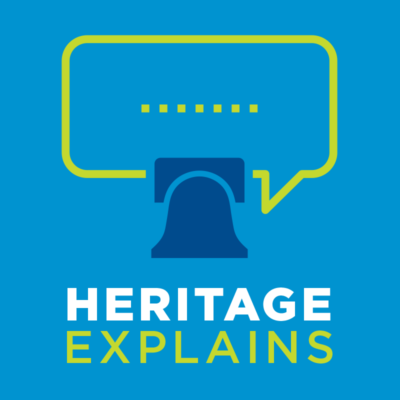 This week, Heritage’s Vijay Menon, a research assistant for Domestic Policy Studies at The Heritage Foundation, explains. Due to the graphic medical descriptions featured in this episode, we ask that you consider your surroundings and take caution before listening to this episode. After over a decade of pro-life victories at the state level, liberals are now pushing back by advocating abortions on demand at all stages of the pregnancy. This week, we take an in-depth look at late-term abortion procedures, and Melanie Israel talks about what conservatives must do in order to ensure that life continues to win. During the 1960’s and 70’s there was a mass removal of the seriously mentally ill from inpatient facilities. The process is referred to as America’s “deinstitutionalization.” So what led to this movement? Where did those who truly needed inpatient care go, and what have been some of the consequences? Heritage expert Amy Swearer explains. As we come to the end of Black History Month, OJ Oleka, Kentucky’s Deputy State Treasurer and Chief of Staff, tells the inspiring story about how conservative policies are reshaping the landscape for minorities in his state and how these ideas can be a model for the rest of the US. What’s in this resolution? How much would it cost? Would it actually work? And is that even the intention of the left? This week, Nick Loris, an economist and Heritage’s Herbert and Joyce Morgan Fellow in Energy and Environmental Policy explains. Did you know that if you live in an economically free society you are more likely to be healthier, happier, more educated, live longer, and take better care of the environment? This week we explain what economic freedom is and why President Trump’s policies are helping us bounce back. The Woman’s March happened last week, and it looked a lot different than it did when it first stated in 2017. In this week’s episode, Kelsey Harkness explains why the March is not connecting with people like it used to, and how the march was flawed from the start. This week, Lieutenant General Thomas Spoehr, debunks some of the most timeworn arguments about defense spending that are used in an attempt to slash the Pentagon’s budget. Show Notes: Peterson Foundation chart vs.
As the Democrats take control of the House of Representatives, we explain how the shift of power is going to impact Conservative’s ability to enact policy, and what they can do to win, in spite of the new political landscape. The first of a special three part series on immigration, explaining the basics on border walls, enforcement, and amnesty with policy analyst, David Inserra. One of the most unique things about America is Hollywood. The movies made by American companies serve as the benchmark for entertainment all around the world, including China. But China is quickly becoming the largest entertainment market in the world, and doing business with them comes at a price. This week, we discuss the intersection of the free market and Chinese censorship in Hollywood, and what that means for our culture. Today, U.S. military planes flew over Ukraine as a warning to Russia. So how did this war in Ukraine actually start? What does Vladimir Putin want from Ukraine? What’s likely to happen next? This week, Heritage expert Luke Coffey helps to explain the conflict in Ukraine. If you’ve debated politics recently, you’ve probably heard from liberals like Bernie Sanders and Alexandria Ocasio-Cortez that America should adopt the socialist polices of Scandinavia. But what does that even mean? This week, we talk with Ambassador Terry Miller to explain this idea and why it is not the “cure” to our issues.